Winter conditions vary greatly from region to region, and day to day. When one thinks of winter driving, the first thing that comes to mind is probably plowing through a blizzard, trying not to get stuck or spin off into the ditch. The reality is - winter driving is a combination of vastly different surfaces - snow, slush, ice, water, and clear pavement. That said, there cannot be one tire that is excellent for all conditions, so winter tire manufacturers have to compromise. On the one end of the spectrum is a tire like the Michelin X-ice. For a non-studded tire it is phenomenal on sheet ice, which is arguably the worst-case scenario in the winter. However it's tread grooves are far too small for it to claw through deep snow, where it becomes next to useless. During an admittedly very rare and heavy snow storm in Toronto, I was not able to drive my Mazda 3 equipped with these tires up my driveway, and had to leave the car on the street. On the other end of the spectrum is a tire that has been my personal favourite for a number of years - the Hankook iPike. It has one of the biggest tread grooves on any street tire I have ever seen. It looks like a tractor tire, and works like one too. I distinctly remember having these tires on my Civic and being able to drive through snow so deep I was actually pushing it away with the front bumper. However, after driving a Subaru Legacy with these tires on a skating rink of a course at the MCO snowcross track, I realized how useless they are on ice. So what's the ideal tire then? Well if studs were an option, a gnarly snow tire like the Hankook iPike or the Firestone Winterforce with studs provides the best of both worlds. If studs are not an option, what's left are "compromise" tires. My personal view is that "studdable" tires are designed to rely on the studs for their ice performance, making them terrible on ice without the studs. That meant all studdable tires were out for us, which included the aforementioned iPike, Winterforce, and a few others. Also I didn't want to give up too much deep snow performance, so big tread grooves and deep tread were important, but on a tire that was still ice-friendly. This meant all the "high-performance" winter tires like the X-Ice and Dunlop Winter Sport were out too. 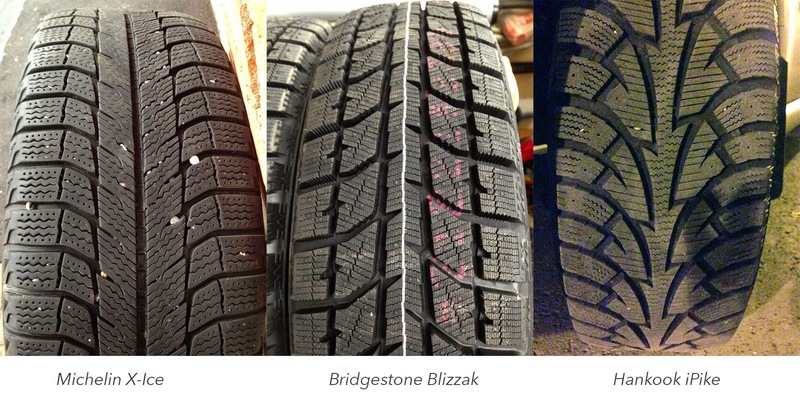 That left us with just a couple tire options: the Nokian Hakkapellita, which gets rave reviews year after year, but is impossible to find online, and the Bridgestone Blizzak which I know is used by a lot of ice racers, has great reviews, and is readily available. Plus I personally raced a Miata with an open differential and rear wheel drive on snow and ice using Blizzaks and was nothing but impressed. Blizzak it was. Now that the tire was selected, the next question was about the size. Of course, one could simply go with the OEM size and be done with it, but where's the fun in that? Because winter poses a lot of unexpected hazards, and the surfaces we race on can get very rough, the taller the sidewall the better. This means using the smallest wheels that would fit over the brakes - 15" in our case - and getting the tire with the tallest sidewall that is available and would fit into the fender wells. A narrow tire can sink into the snow rather than floating on top of it, meaning you could use the sidewall of the tire as well as the tread for more cornering grip. A narrow tire means that you are applying more pressure to the surface. Think about it - a car applies pressure to the road surface through the contact patch of its tires. Given the weight of the car, and the area of the contact patches, it will apply some x pounds per square inch. To increase that pressure you need to either increase the weight, or reduce the contact patch. More pressure means more grip, which is why heavy vehicles like buses and trucks can sometimes get away without winter tires. WRC teams run 165-185mm tires in the snow, and I have a sneaking suspicion they know what they're doing. So we agree that narrow is best. Is there such a thing as too narrow? There is. The problem is that the amount of weight a tire can safely support is determined by the volume of air in the tire. Go too narrow, and suddenly the tire can no longer support the weight of your Impreza no matter how much "unnecessary parts" you strip off. Naturally, you're also limited by what's available on the market, and for our Blizzaks on a 15" wheel, I found that limit to be 185mm. The tallest sidewall available on this tire was a 65, so we got our size: 185/65/15. The tires are on the delivery truck as I write this, so as soon as they arrive and as soon as the rally gods will give us some nice winter weather, we'll see if our driving impressions actually support the theory.